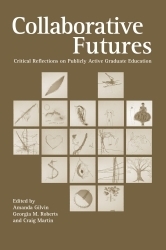 Collaborative Futures places graduate education at the center of ongoing efforts to legitimize publicly engaged scholarship within the academic profession. It is indispensable reading not only for graduate students seeking inspiration, resources, and usable frameworks for their engaged scholarship, but for the faculty who are called upon to mentor them and for university administrators seeking encouraging answers to questions about the future of graduate education. Given the erosion of the tenure system and the casualization of teaching labor, graduate programs and professional organizations in many fields now recognize the imperative to prepare doctoral students for careers wholly or partially outside academe. This book powerfully indicates both the need and the means to change institutional cultures and forge a publicly active path for graduate education. Find out more at the Syracuse University Press.